Every day it seems we hear health experts extol the health virtues of eating fish. I'll be the first to admit, this is definitely something I need to improve upon. I don't “love” salmon, but have found ways to make it more tasty, like in a salmon salad or smothered with a pretty salsa. Living in the land of 10,000 lakes, I am partial to fresh caught lake fish and adore it almond crusted. I am hoping my friends and family who are into ice fishing will share some of their catch with me this winter. In the meantime, there are lots more fish in the sea and I am making it a point to find other tasty options. Would you believe me if I told you, up until a few weeks ago, I had never tried scallops? Well, it's true. I often thought about picking some up, but hesitated because of their “rubbery” stereotype. Let's face it, responsibly caught scallops are a pretty penny per pound, I'd hate to spend my precious food dollars on rubbery tasting food. Even if it is healthy. Well, it just so happened, my friend Jen Sinkler, Fitness Editor at Experience Life Magazine, shared a hook-up with me for some amazingly gorgeous seafood from Lobster.com. I seized the opportunity to try some, as fresh as they come, “Dry” Sea Scallops. Whoa! These did not disappoint. As you can see from the picture they tasted as amazing as they look. The best tasting and healthiest scallops contain all their natural ingredients, including their milk. Fresh scallops are sticky to touch due to their natural protein coating. Scallops should have a fresh sweet sea smell. The colors of the scallops vary by season, from ivory, to tan, to pinkish-orange. Look for “dry” scallops that are not chemically treated. The best way to prepare is with a healthy cooking fat and high-heat. Properly cooked scallops will have a caramel crust, translucent center and spring back with a light touch. Scallops turn rubbery when overcooked or if not served immediately upon cooking. Scallops pair well with green vegetables, like broccoli, spinach and arugula. To learn more about how to select sustainable ocean-friendly seafood check out Seafood Watch. In a seasoned 12-inch cast iron skillet cook bacon over medium heat. Turn frequently until cooked to desired doneness. Remove bacon, cool then crumble. Turn heat up to medium-high and with tongs, place sea scallops 1-inch apart, in hot bacon grease. Cook one to two minutes per side depending on thickness. Place on serving dish and season with Celtic sea salt. When serving top with crumbled bacon. In a 6-qt pressure cooker add trivet, then basket. Place broccoli florets in basket and add 1/3 c. water. Cover. On high heat, bring to high pressure then reduce heat to low and cook for 2-3 minutes. Quick release pressure and uncover. Place in serving dish and season with ghee and Celtic sea salt. You will notice there are no amounts in the ingredient list. This recipe is scalable based on how many you are serving. 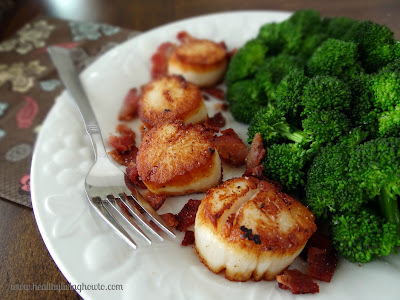 Plan for 4-6 scallops, 2-3 pieces of bacon and 1 1/2 cups broccoli per person. Be careful not to overcook scallops; the center should be slightly translucent and springy to touch. Scallops turn rubbery if you wait too long to serve, so plate right away. And enjoy!